Doctor Who: The Original Season 23 - YELLOW FEVER AND HOW TO CURE IT | Warped Factor - Words in the Key of Geek. 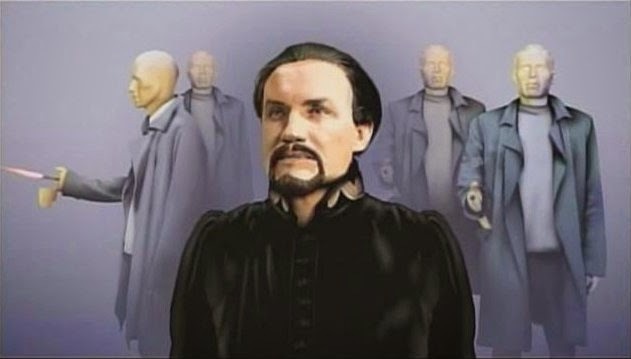 Something of a treat was planned for the fourth story of the Season 23 that wasn't to be, as Robert Holmes' contribution, Yellow Fever And How To Cure It, at one point featured the Autons alongside the Master (who would of course pop up in The Ultimate Foe as a surprise witness at the Doctor's trial), and the Rani. The two had forged an alliance in the earlier The Mark Of The Rani, her introduction, in which her attempt to exit stage left having been rumbled in Killingworth doesn't go entirely to plan! MASTER: Fascinating. But then anything connected with you would undoubtedly be fascinating, my dear Rani. RANI: I thought that last mad scheme of yours had finished you for good. MASTER: You jest, of course. I'm indestructible. The whole universe knows that. MASTER: Really, my dear Rani, you and I should be friends. I'm one of your greatest admirers. RANI: Oh, don't bother with flattery. I know why you're here. I saw the Doctor. MASTER: Then you know why I need your cooperation. MASTER: You'll change your mind when you hear my proposition. RANI: I am not interested in your pathetic vendetta one way or the other. Now clear off and let me get on with my work. MASTER: If only it were that simple. However, I'm afraid you've very little choice. Either you collaborate or I bring this little venture to an extremely untimely end. And of course, he gets his way with a simple bit of blackmail. Though their escape in her TARDIS goes a bit wrong, incurring a kick in the Sandra Bullocks for the Master from his reluctant ally! MASTER: Quickly! You'll destroy us both. RANI: I will? You blame me? You wouldn't be told. MASTER: What is it? What's wrong? RANI: It's our speed. It's increasing. RANI: You asinine cretin, what do you imagine I'm trying to do? RANI: It's the acceleration! Time spillage! MASTER: We're trapped, you blundering woman! "It would have involved Peri hankering for a trip home to the United States, and began with her seeing the Statue of Liberty through the TARDIS screen. Then she discovers it’s a replica in an ornamental garden. that was just one of a wide variety of locations we planned to use in Singapore. The story would have involved Kate O’Mara as the Rani." The Autons would have been revealed as their allies, taking advantage of the then-flourishing trade in plastics in that particular corner of the Far East. They, of course, had first appeared in Spearhead From Space alongside the débutante Third Doctor, going on to work with the Master in Terror Of The Autons as he announced his arrival on Earth in quite some fashion! Of course, the abandonment of the planned season in favour of Trial Of A Time Lord meant we never got to see big trouble in little Singapore, Holmes' death further complicating the issue of adaptation. The Sixth Doctor never did face off against the Autons on screen, but fast forward to 2005 though, and the Nestene Consciousness/Autons were back alongside Christopher Eccleston's Ninth Doctor in his own first appearance, just as they had been the first real test of Jon Pertwee's newly exiled to Earth Third. "When he was asked how he would have liked to look as the Doctor, his description brought visions of Eccleston’s outfit to mind: a black jacket and jeans. Like Eccleston, Baker was not interested in looking flamboyant, but then-producer John Nathan-Turner’s vision won in the end."